Waking up at 11:24 a.m.
Irish Oatmeal with Chia Seeds, Maple Syrup, Peaches, Cinnamon, and Almond Milk. Iced Coffee with Maple Syrup and Cream. Teaching a couple lessons at Music Makers then teaching an in-home lesson in Kempsville. My mom upgraded to an iPhone 5s. 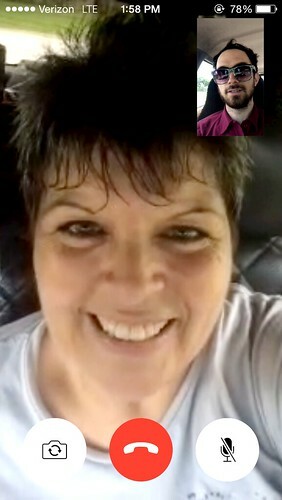 We can finally FaceTime each other. Scrambled Eggs. Naan Bread with Non-Dairy Cream Cheese and Jam. Tortilla Chips with Avocado. Honey Green Tea. Teaching more lessons at Music Makers. One of my newer students, a 5 year old, passes gas pretty loud during our lesson. He just laughs and says, "I tooted!" This kind of thing seems to happen quite often. I don't know what it is about my piano students farting. Maybe it has something to do with sitting on the hard surface of the piano bench. At the Great Neck Rec for adult basketball. On the all-star team tonight. I've found as of late that I'm a lot better at passing the ball instead of just shooting all the time. I've trained myself to keep my head up and check out what's going on around me. Preparing a dinner for Ana and I: Chicken with Broccoli, Carrots, Onions, and Vermicelli Rice Noodles. Playing a little guitar quietly in my room.